The new device stems from the company's ongoing relationship with Disney. Sphero's made a name for itself with connected, rolling toys like the Ollie, SPRK and, perhaps most famously, the Star Wars-inspired BB-8. Of course, the company couldn't have brought its replica of the Force Awakens character to market without Disney's approval, and the two seem to be keen on working together. 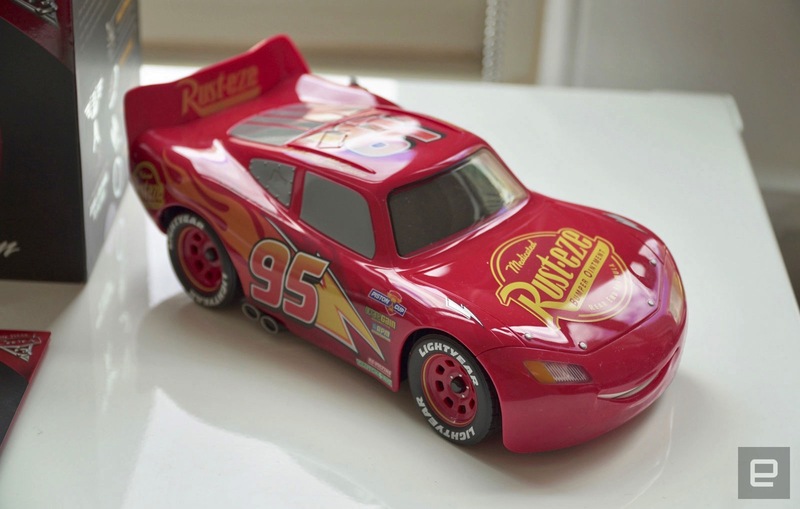 Today, Sphero introduced its first app-controlled car, based on the "Ultimate Lighting McQueen" personality from Pixar's Cars franchise. Sphero says the new toy is its most animatronic device yet, featuring six motors for steering, drifting, lifting and moving up and down, as well as animated eyes and a mouth that make it feel more realistic. In addition, there are five capacitive touch panels around the vehicle's shell, which let you do things like wake it up and have it talk to you by simply rubbing your hands on spots like the windshield. The companion app isn't only for driving, as Sphero's built-in a few games and activities, including a training mode that helps you to get used to Ultimate Lightning McQueen quickly. The car is said to last about 40 minutes on a charge, with top speeds hitting about 6mph (10kmh). If you're into it, its price may bring your spirits down a bit: Sphero's pricing its new toy at a whopping $299/£299. If that's not a deal-breaker, you can order one today from the company's site. The toy is expected to ship in time for the premiere of Cars 3 on June 16th. Edgar began hitting newsrooms as a young kid in the ’90s, when his dad worked at a regional newspaper. Growing up, he had two passions: technology and football (soccer). When he wasn't on the pitch scoring hat tricks, he could be found near his SNES or around the house, taking things apart. Edgar's also deeply in love with tacos, sneakers and FIFA, in no particular order. He lives in New York City with his better half.